Located in Fort Collins, CO, I d’Eclair Pastry is a wholesale and retail bakery creating scratch-made, unique baked goods handcrafted by our chef and owner, Elizabeth Meyers. There are countless companies that offer mass-produced, shelf-stable bakery items filled with conditioners and stabilizers that can be shipped around the country and that appear in coffee shops and grocery stores nationwide. There are but a few local companies that offer small-batch, made from scratch, handcrafted baked goods that contain no artificial flavors or preservatives–food that you can feel good about eating. I d’Eclair Pastry is proud to provide that service for our friends and neighbors in Fort Collins, Loveland, and the Front Range area. In a world where seemingly everything is becoming large scale and mechanized, we believe people deserve to nourish their bodies and hearts with food that is made by hand with great care, by people who do this for the love of it and not simply for a paycheck. Many of the city’s landmark restaurants, coziest coffee and tea shops, and premier medical facilities feature our desserts and baked goods. Find our treats at the Moot House, Sonny Lubick Steakhouse, Mugs Coffeehouse, Ku Cha House of Tea, Medical Center of the Rockies, and Harmony Cafe. We can be booked for private events too, so please consider inviting us to your wedding, holiday party, or other event! In addition, we are available to deliver to your office for meetings or celebrations. Just give us a call: 970.556.3910, or email us: ideclairpastry@gmail.com. 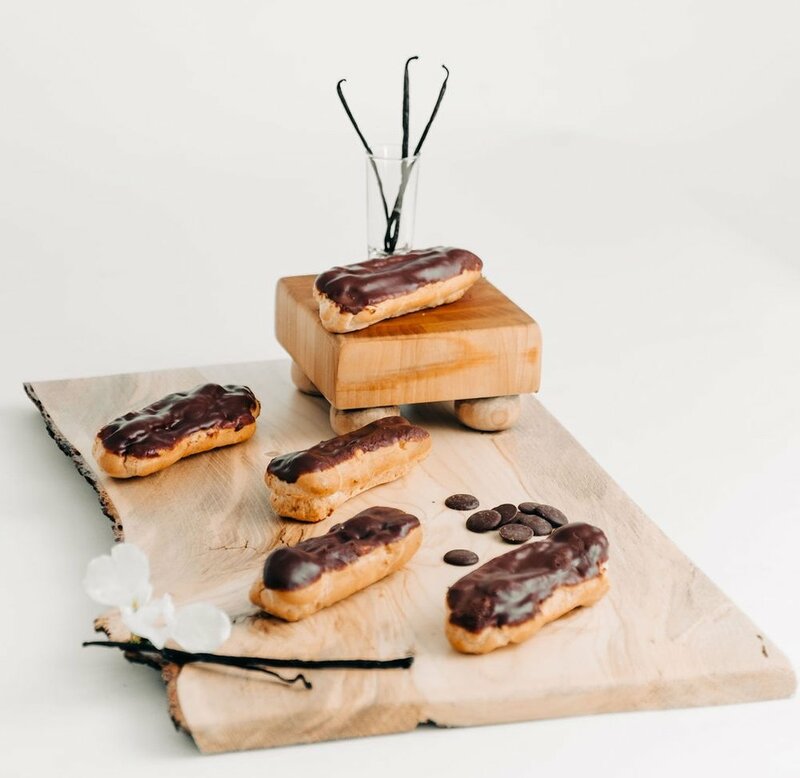 At I d’Eclair Pastry, we believe food provides more than just nourishment for our bodies – it feeds our mental well-being and fosters our connections to other people and to the land. We want you to feel good about what you’re eating, and we want to play a role in the success of our local food economy. That’s why we feature ingredients from Colorado farms and support other producers and businesses along the Front Range and Western Slope. I love food. Eating it, growing it, cooking with it, and sharing it with others. I could while away the afternoon thinking about how to make the best use of a basket of red and gold raspberries or reflecting on the attributes of a perfect macaroon. Rolling and shaping pastry dough is therapeutic, and my nightstand is more likely to hold the latest issue of Cooks Illustrated than the current bestselling novel. I’m thrilled to be able to share my passion for food and baking with you through I d’Eclair! Pastry. I guess you could say I’m a man who wears many hats. Unsatisfied with the daily grind of life as a real estate attorney, I decided to pursue my creative and artistic side by building my own landscaping company. While satisfying, I couldn’t resist the opportunity to create a bakery on wheels – the artistry, craftsmanship, and engineering challenges involved in building the one-of-a-kind I d’Eclair! Pastry mobile cart were thrilling! Now that the cart is a reality, you are likely to find me at our bakery, ensuring everything is running smoothly so our small staff of bakers can continue to provide you with made-from-the-heart treats you will feel good about eating. Mixed Berry, Apple, Brown Sugar Cinnamon, and more! Made with handmade fruit preserve filling, surrounded by our tender sweet tart crust, and topped with a made-from-scratch icing. Light pate-a-choux filled with vanilla pastry cream and glazed with chocolate ganache. Our namesake pastry! Blueberry, Lemon Poppy Seed, Banana Streusel, Morning Glory, the possibilities are endless! Our signature, slightly tangy sourdough pastries are crowned with a generous helping of cream cheese icing. Mmmm…. Toasted pecans and honey caramel cover our tender sourdough pastry with sticky goodness. These magical bars can vary from Peanut Butter Blondies to Chocolate Raspberry and more! Filled with heart healthy nuts and the perfect touch of sweet, they’re great for any time of day! German for "cake," our kuchen is a sweet, yeasted dough (similar to brioche) topped with freshly made fruit preserves, pastry cream, brown sugar streusel, and powdered sugar icing. Chocolate chip, Oatmeal Raisin, and more! A classic that tastes better than any cookie you’ve ever had! Our scones are made with sweet cream butter, heavy cream, and a variety of fruits, chocolate, or nuts. Featuring flavors like Snickerdoodle, Blueberry Lemon, Mocha Chip, and Sea Salt Caramel! These moist, chewy, gluten-free cookies are for true coconut lovers! We top ours toasted almonds and a chocolate drizzle. Do you need a wedding cake, birthday cupcakes, or catering for a meeting? We can treat you to the best, most thoughtful custom creations around! Simply fill out your request in the form below and allow 48 hours notice. We are the NOCO Kitchen by I d' Eclair Pastry. Commissary kitchen located ideally near downtown Ft. Collins and I-25 in the river district (old airport commercial area). We are currently offering commercial kitchen rental and storage space. It is our sincere mission to help those people in our community who wish to start up (or are currently engaged in) food related businesses succeed. One of our primary goals is to provide each member a clean, safe and workable space in which to store and create their products as part of their business. Please contact Tim at nocokitchen@gmail.com to discuss your particular needs and schedule an appointment to come see if we would be a good fit! Want to know more about custom products or how to order? Call, email, or fill out the form below! Items Available: Cinnamon Rolls, Sticky Buns, Jam Tarts, Muffins, Bars, Kuchen. Items Available: Cinnamon Rolls, Scones, Coconut Macaroons, Éclairs, Jam Tarts, Blueberry Muffins. Items Available: Autumn Chai Cookie, Matcha Cookie, Lemon Blossom Oolong Bites, Roasted Walnuts, Roasted Almonds, Shaolin Cookie, Foco Cocoa Cake, Madagascar Vanilla Scones.